Zebediah Torre was a journeyman who lived in a small hovel near Buckland. Every week he and his pony would trudge the ancient track called ‘The Abbot’s Way’ to Princetown and then cut across on the old Ashburton to Tavistock path, which led him to the local market at Tavistock. He was a sombre character both in appearance and nature. His life was one of routine, so much so that the stone cutters who worked on the tors above Merrivale would know that as soon as they saw the hunched figure of Zebediah and his pony ascend the hill leading up from the Long Ash enclosures it was time for breakfast. They also knew that when they saw him return the day’s labour was over. Week in, week out, rain, snow or sun he never once missed. Unlike many of the other traders at Tavistock market he never socialised in the Taverns after a good days trading. People used to say that to hear him utter more that ten words was a rare as a ‘summer ammil’. As with any private person speculation as to his wealth abounded. He was never seen to part with money so therefore he must have had a hoard of coins miserly cherished and as safely hidden as a squirrels winter stash of nuts. Living memory could not find an instance of him wearing anything but his black moleskin trousers, his rust coloured coat and his brown wide brimmed hat. Clearly none of his wealth went towards clothing and by his skeleton-like build very little went towards food. One October morning the usual Wednesday ritual was performed. 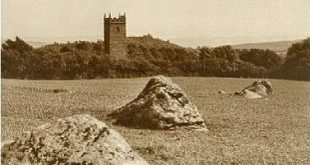 The stonecutters on the tor looked to the south to see if the familiar sight of the journeyman could be seen. It was a finger numbing cold morning and they were eager to have some sustenance to warm themselves. Sure enough a solitary figure was spotted slowly trudging up the hill with his laden pony. The little bells on the crook could be heard tinkling like ice covered branches shaking in the wind. “There be ole Zeb, must be time for zum crib” shouted one of the stonecutters, the relief telling in his excitement. “Yes, there goes the old bugger, off to Tavvy to put some more coin into his hoard” another bitterly remarked. That said the pot went on the fire and soon the steaming hot tea was served along with the usual bread and scrape. As the day progressed the sky changed to the threatening grey pink colour that all moorfolk know only too well means snow is coming. The stillness of the air meant you could plainly hear the sheep coughing on the far off tors. It was two o’clock when the first flakes of snow began to fall. They were large and dry and floated with a vengeful purpose. By three o’clock the clumps of tussock grass had only their spear-like tips piercing out of the accumulations of snow, the wind was gathering strength as well. This was a sign for the stonecutters to move homewards to the warmth and safety of their small cotts. Down in Tavistock the market traders were busy trying to secure overnight rooms at the various taverns, having had a busy market they were willing to part with some of the days profits in exchange for a warm bed, hot food and the knowledge they would not have to make a perilous home journey. All bar one trader that is, Zebediah was last seen bent double against the wind slogging up out of the town. One trader shouted to him, “be ee mazed man, yer u’ll never make it home in this, Widecombe folk be a plucking their geese”. This was an old expression meaning there was heavy snow on the high moor. The only reply the trader got was a snort from the pony, or at least he thought it came from the pony, and the sound of a lone tinkling bell or was it the sound of coin jangling in a pocket? As the stonecutters came to the white expanse which a few hours earlier was the Princetown road they could hear the tinkling of a pony crook bell. It was crossing the common below, with disbelief one of them remarked how “that bloody ole miser couldn’t even part with a nights board to save ee’self this frozen, wind blasted journey, I hope the cold catches ee”. With that neighbourly comment they disappeared into the swirling snow. The following morning was crisp and bright with the moorland landscape blanketed in snow. The stonecutters walk up to their setts as they new that the swirling snow probably had left their small quarry alone and after all no work no pay. As they approached the Merrivale road they could see in the distance a lone pony stood a still as a statue. “That’s ole Zeb’s pony bain’t,” remarked one of the party. “Naw tis only an ole moor pawny” replied another. “Then what’s that tinkling I do ‘ear,” argued the first. Sure enough a faint jangling of bell could be heard. “The pawny be down by the kist”, said another, and with that they waded through the snow towards the pony. On arriving at the kistvaen they found the pony trembling with cold and nuzzling the mound of snow that had blown over the old kistvaen. “Told ee t’was Zeb’s pawny” triumphantly exclaimed one of the cutters. “Where be the old bugger then” queried another, casually kicking at the mound of snow. “Dawn’t knaw, but one thing I do knaw is that there is an ole in that Kist there” came the reply. With that the men looked at the kistvaen and saw to their surprise that the lid of the ancient tomb had been split. “Twas alright on Sunday cause me and mother had a bite of crib on it when us come back vrom visitin’ her mother at Tavvy”, noted another cutter. With that they began clearing the snow away and sure enough the huge granite slab had been split in three parts. “Well that took zum dooin,” whispered another. The cutter who had previously dined on the slab nervously whispered, “There be summat in the tomb” and pointed at a heap hunched up in the depths of the granite chest. Warily one of the men prodded the snow-dusted bundle. “Tis frozen solid” he exclaimed. With that his stick nudged off the top of the heap revealing a blue, ashen face, contorted in agony. “Hell, tiz a hooman” he yelped, leaping back in surprise. It took a few moments for the men to regain their composure but when they had they all huddled back over the kist and morbidly peered into its depths. “Be it one of the old volk?” asked one of the men. Another peered deeper and disclosed “naw it be ole Zeb Torre, the ole miser must ‘ave split the slab to take cover in the tomb from yesterdays storm and now ee lies as stiff as a spalliard in a potato cave”. The rigid body was exhumed and laid across the crook on the ponies back and led back to Tavistock. The local consensus was that his miserly ways had cost him his life. Having refused to find the price a warm bed for the night the old journeyman had struck off for home. By the time he had reached the kist the storm had whipped up into an icy frenzy and in desperation he had somehow split open the ancient tomb and climbed inside to get some shelter from the lethal blasts of the moorland winter. Not realising the tomb was lined with granite it was as if he had gone to sleep in an icehouse. Once again the old tomb had invited another guest to stay. Some say it was not the freezing cold temperatures that had claimed his life but that an ancient curse had been placed on the old monument whereby anyone desecrating it would also be interred for eternity along with the spirit of the ancient ancestor once buried there. Mrs Bray, 1836, fancifully depicts the kistvaen as a cromlech and notes that “there are many remains of Druidical antiquity; such as a fallen cromlech, a barrow, an obelisk, a large circle, and several foundations of the round huts or houses of the Britons.” She later attributes these features as “remarkable vestiges of the cursus, or via sacra, used for processions, chariot races, etc., in the Druidical ceremonies.” Here we have another example of how the early antiquarian’s firmly believed that many of the Bronze Age features were used by the early Druids. It is also worth remembering that Wistman’s Wood is about 4 miles away as is Beardown Farm where the Brays once lived. Crossing, 1990, p.95, states the following: “…is a ruined kistvaen. This was formerly regarded as a dolmen or cromlech, and is marked as such on a plate illustrating a paper by the Rev. Samuel Rowe… Unfortunately the cover stone is broken and one of the side stones also. This damage was done about the year 1860; gate posts being cut from the former and part of the latter being removed. A few years ago an examination was made of the kist, and a flint scraper, flake and polishing stone were found”. Butler, 1994, p.30 estimates that the cairn which once covered the kistvaen would have been 2.2m long, making it one of the largest on the moor. The kistvaen was already exposed and intact when Mrs Bray visited it in 1802. But by 1870 the slab, as already been mentioned, was damaged. Rowe,1985, p.208, notes that in the 1860s a man called Harding cut two gateposts out of the capstone. Bulter, J. 1994 Dartmoor Atlas of Antiquities – Volume 3, Devon Books, Tiverton. Hemery, E. 1983 High Dartmoor, Hale Ltd, London. Page, J. Ll. W. 1985 An Exploration of Dartmoor, Seeley and Co. London.